From the bustling city to the tips of its peninsulas, South Australia is a state of contrasts and adventure. Sample some of the world’s greatest wines, seek out natural and manmade wonders, and follow in the footsteps of the settlers, miners and cameleers who made the state their own. The Festival State’s festival city has markets, beaches, sport and culture that just beg to be explored. Lose yourself in the city’s 29 parks. Wine, walking and wildlife. Discover an Australia with a distinctly Germanic feel. Eat, drink and be merry in South Australia’s wine capital. The Herbig Tree and Whispering Wall aren’t to be missed either. 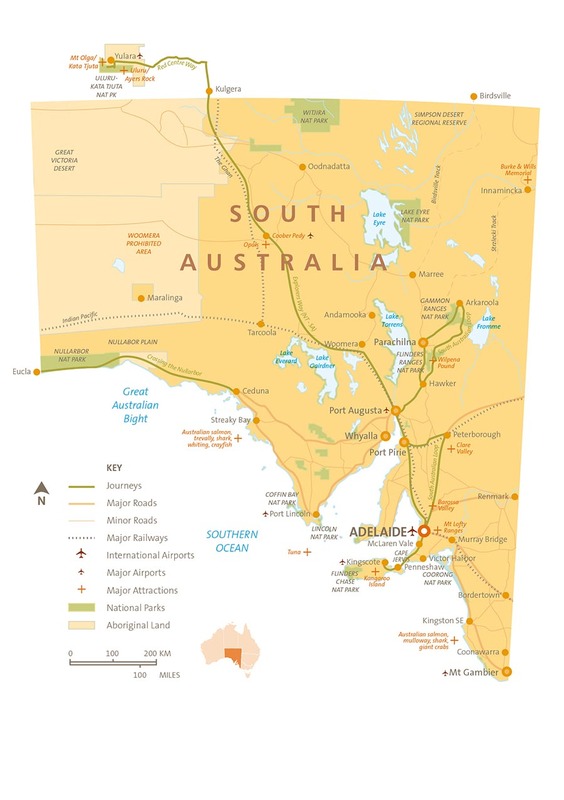 South Australia’s land of adventure: cross the Nullarbor, fish, surf, swim and dive with sharks. Wide beaches, fertile vineyards, wild bushland and the mighty Murray Mouth make for a landscape you need to explore. Painted Desert, Moon Plain and a wealth of aboriginal sites. Explore a land of mystery and majesty. Australia’s third largest island is a place of natural wonders, wildlife encounters and some fantastic sand surfing in the Little Sahara. A rich and fertile land of caves and lagoons 20 million years in the making. Made for walking, diving and caving. The mighty Murray River has been a lifeline for settlers since the 19th Century. Today, you’ll find a world of adventure in it, on it and near it. Find rich heritage, great beaches and fabulous diving (including shipwrecks) on SA’s Copper Coast. Fly direct to SA’s capital – Adelaide – from major European, Asian, American and New Zealand airports and all Australian capital cities. The city is well served by interstate coaches and trains. And for the ultimate Adelaide-bound transport, take The Ghan from Darwin.